It’s been said there’s a fine line between creativity and insanity, and the more creative designers get, the more insane their creations become. 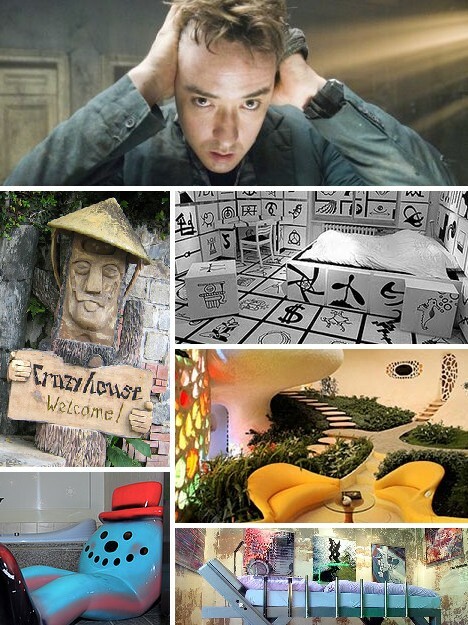 These 10 insane interiors and radical room designs show what happens when one moves beyond the fundamental to, well, just mental. Travelers to Berlin rave about the formerly divided city’s wild & crazy nightlife. While nightclubbers can easily get their fill of the former, a stay at the Propeller Island City Lodge will provide a hefty dose of the latter. Each of the hotel’s 45 rooms is designed by Lars Stroschen and decorated in a different theme, ranging from peaceful and dreamy to bizarre and nightmarish. 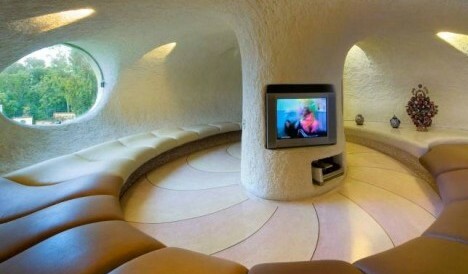 Take the Symbol Room, for instance. 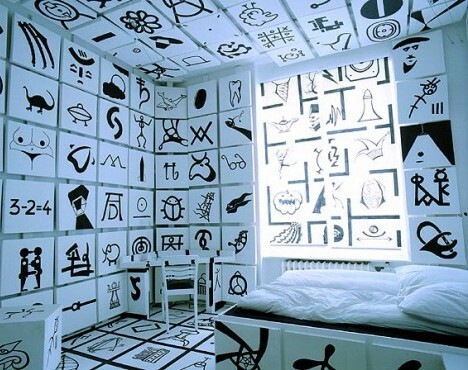 The walls, floor, ceiling, even the bedroom furniture have been decorated with 300 symbols taken from Stroschen’s decidedly odd imagination. 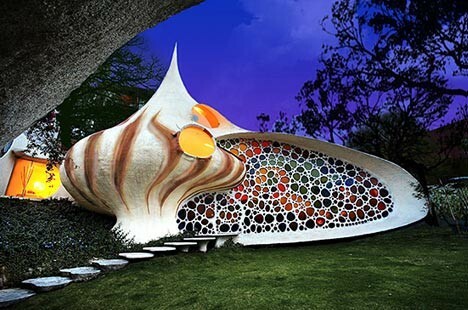 In designing the Nautilus House, Mexican architect Javier Senosiain appears to have channeled Lewis Carroll after ingesting some particularly bad acid. 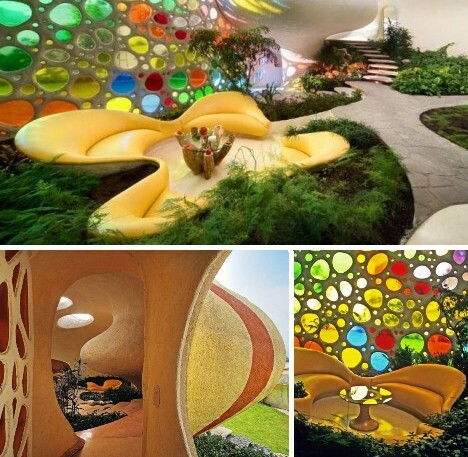 On the other hand, and unlike most drug-induced schemes, the Nautilus House is fully functional inside and out, though it might take a very dysfunctional family to actually live in it. Senosiain’s genius shifts into high gear when visitors enter the house. There’s a reason the chambered nautilus never leaves its chambers – if it looks this good, who would? 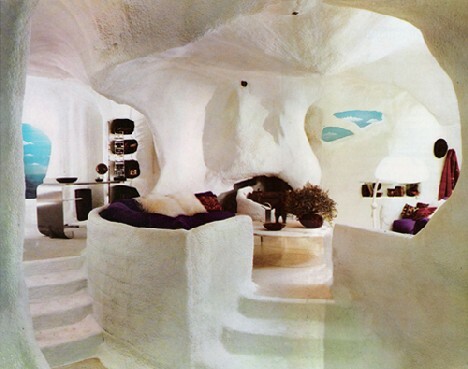 If Barbara D’Arcy’s 1973 book The Bloomingdale’s Book of Home Decorating is to be believed, we should all be living in stylishly decorated caves by now. Turns out, only Bin Laden is… though he seems to be having a grand old time of it. 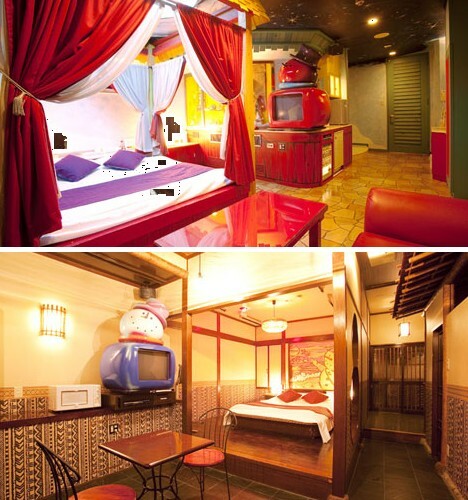 Love Hotels are a very special Japanese phenomenon that, in a nutshell, are hotels designed for love… and not the platonic kind. As such, the rooms are often decorated as elaborately as possible to match the fantasies of the clientele. With 30,000 to 40,000 Love Hotels scattered across the country, that’s a lot of rooms – and a lot of fantasies. Photojournalist Misty Keasler has made it her mission to chronicle the many variations on the Love Hotel theme and present them in a non-judgmental, artistic way to show off their distinct flavor. 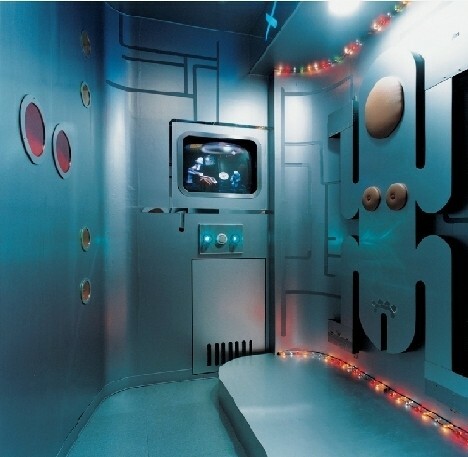 If consenting adults want to get busy in what seems to be a classroom, a subway car or the International Space Station, fine & dandy- better there than in the real thing. 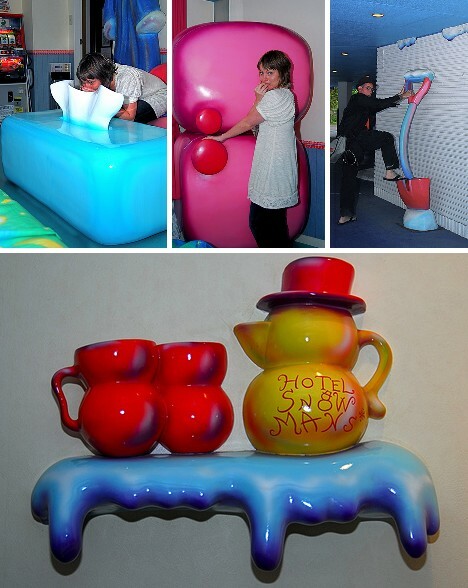 Among Love Hotels, the Snow Man’s in Kobe stands out – and that’s saying a lot. At least one of the rooms features a variety of icy imagery tempered with surrealism: like an oversized tissue box for a coffee table. As for the guy in the bathroom who could be Frosty’s freaky cousin, we don’t know and we don’t WANT to know. Plaza Angelo Group, the company that owns the Snow Man’s, has other hotels that appear to offer the same chilly experience. They go by the names Snow Ranger, Red Snow Man’s, Planet Snow Man’s and Milky Snow Man’s. Have fun, kids… and play safe. 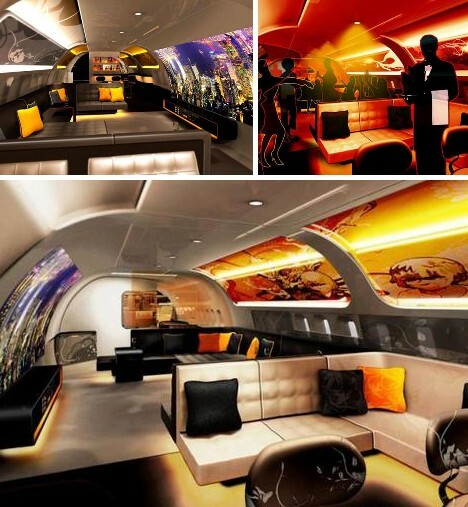 “Designer Jet interiors for the rich and famous…” Seriously, who else besides the rich and famous can afford a designer jet interior, let alone the actual jet to wrap around it? Certainly not Joe Sixpack – unless he bills it to the RNC. But I digress. 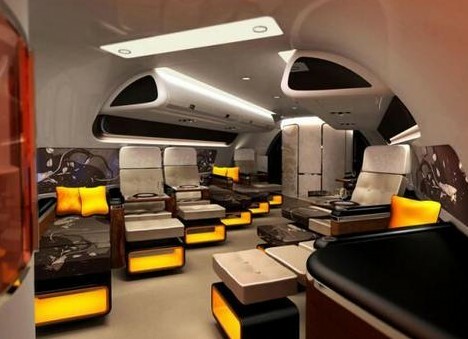 These over the top and over the troposphere jet interiors make flying the friendly skies that much cozier. Best yet, the bar never closes. Car interiors can get as crazy as they come and really deserve their own dedicated article but we can sum up the entire genre succinctly with the image above. 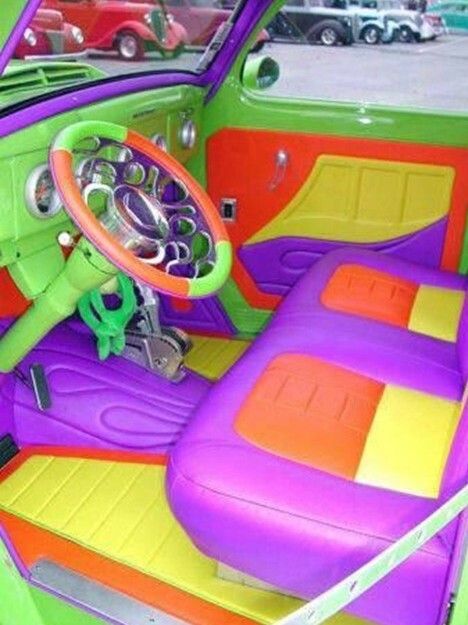 This wild car interior has been done up in 4 brilliant hues not found in nature – at least, not on THIS planet. It’s not known if the driver is color-blind or not but one must assume that’s the case. How else could they drive more than a block without passing out.? 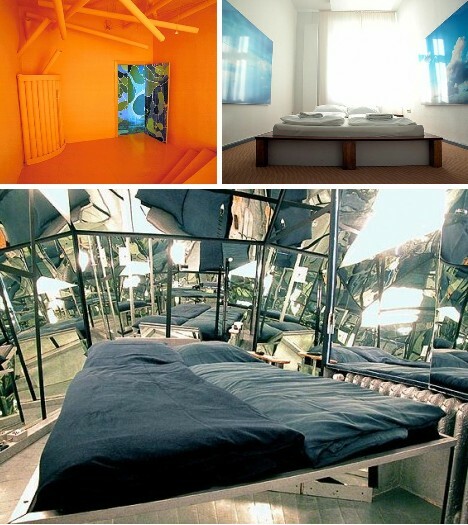 This frightening bedroom – people are expected to sleep here? – seems more Hyde than Jekyll. Notwithstanding the bizarre bed itself, which looks like a prop from The Pit and The Pendulum, the rest of the so-called decor appears designed to disturb. It’s not stated what the microphone and the rock suspended from a rope noose are for, but you can be sure it’s for no good purpose. 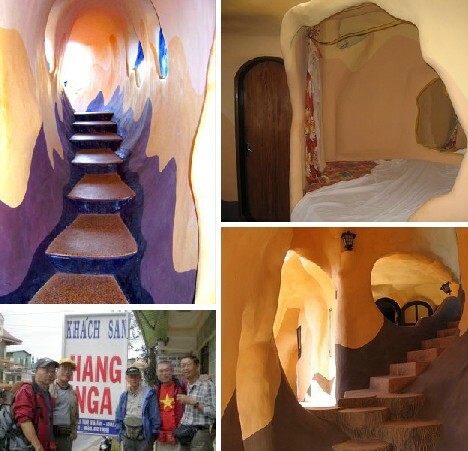 Vietnam has loosened up a lot since communism was officially consigned to history’s ash heap but even so, the Hang Nga Guesthouse really takes a great leap forward. As for its name… be assured it sounds a lot better with the native pronounciation. 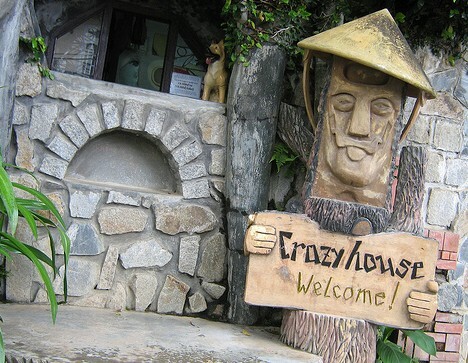 The Hang Nga Guesthouse (also known as the “Crazy House”) was designed by – wait for it – Hang Nga, the daughter of a 1980’s president of Vietnam. 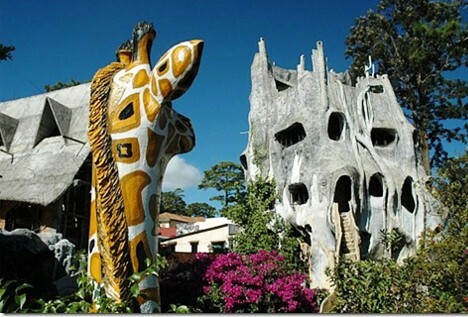 Located in the town of Dalat, the guest house’s rooms can be booked by tourists and they even offer a non-smoking room… who needs to smoke when you’re inside an architectural hallucination? Room decor driving you crazy? 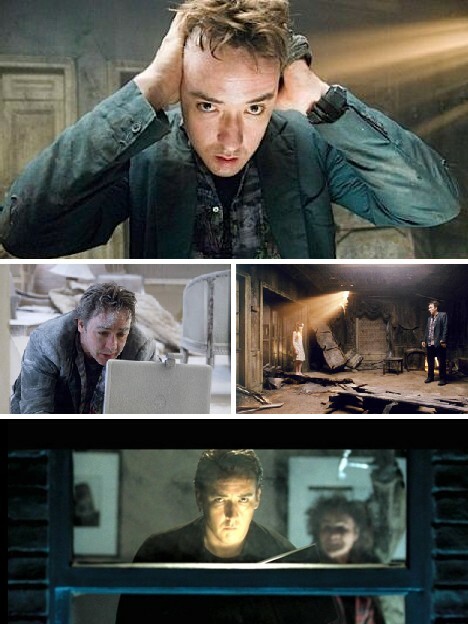 You must be in room 1408, the haunted hotel room in the Stephen King story based movie of the same name. The digits 1,4,0 and 8 add up to 13, you see, and… well, anyway, if we learn anything from the film it’s that having killer decor isn’t always a good thing.